I feel so fortunate that in my diocese, masses are held on the first Sunday of the month in the various Catholic Cemeteries. 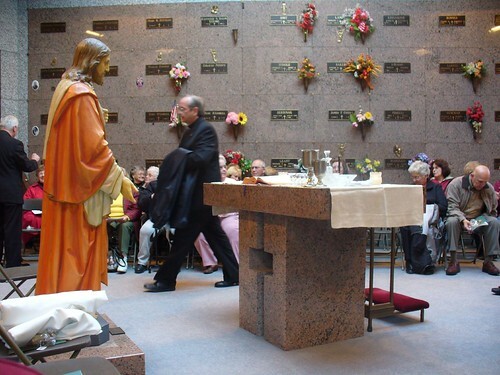 Of course masses are said in all of the Catholic churches on All Souls day, but I'm happy the diocese makes the effort to have mass said right there among the graves for a real celebration of life and resurrection. It is a Catholic tradition to pray for the dead during the month of November and particularly on All Souls Day. In the early days of the Church, the names of the faithful departed were posted in Church so that the community would remember them in prayer. In the 6th century, the Benedictine monasteries held a solemn commemoration of deceased members at Whitsuntide, the days following Pentecost. In Spain, St. Isidore (d. 636) attested to a celebration on the Saturday before Sexagesima Sunday (the second Sunday before Lent, the eighth before Easter in the old calendar). In Germany, Widukind, Abbot of Corvey (d. 980) recorded a special ceremony for the faithful departed on Oct. 1. St. Odilo, the Abbot of Cluny (d. 1048), decreed for all of the Cluniac monasteries that special prayers be offered and the Office of the Dead sung for all of the souls in Purgatory on Nov. 2, the day after All Saints. The Benedictines and Carthusians adopted that same devotion, and soon Nov. 2 was adopted as the Feast of All Souls for the whole Church. Other customs have arisen over time in the celebration of All Souls Day. The Dominicans in the 15th century instituted a custom of each priest offering three Masses on the Feast of All Souls. Pope Benedict XIV in 1748 approved this practice, and it rapidly spread throughout Spain, Portugal and Latin America. During World War I, Pope Benedict XV, recognizing the number of war dead and the numerous Masses that could not be fulfilled because of destroyed Churches, granted all priests the privilege of offering three Masses on All Souls Day: one for the particular intention, one for all of the faithful departed, and one for the intentions of the Holy Father. Other customs have developed regarding All Souls. In Mexico, relatives make garlands, wreathes and crosses of real and paper flowers of every color to place on the graves of deceased relatives the morning of All Souls. 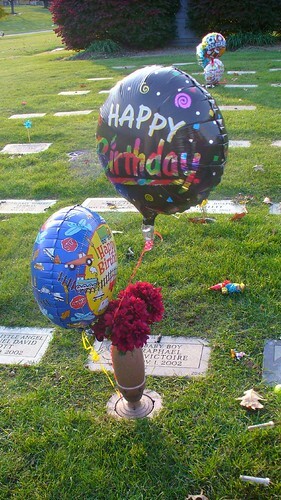 The family will spend the entire day at the cemetery. The pastor will visit the cemetery, preach and offer prayers for the dead and then bless the individual graves. "Skeleton" candy is given to the children. Similar practices occur in Louisiana. The relatives whitewash and clean the tombstones and prepare garlands, wreathes and crosses of real and paper flowers to decorate them. 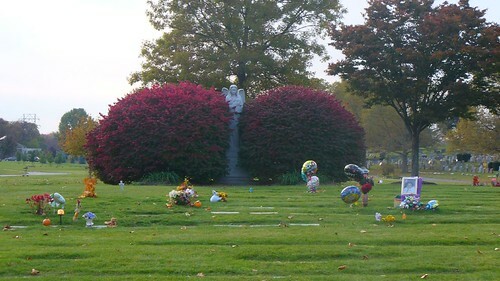 In the afternoon of All Saints, the priest processes around the cemetery, blessing the graves and reciting the Rosary. Candles are lit near the graves at dusk, one for each member of the deceased. 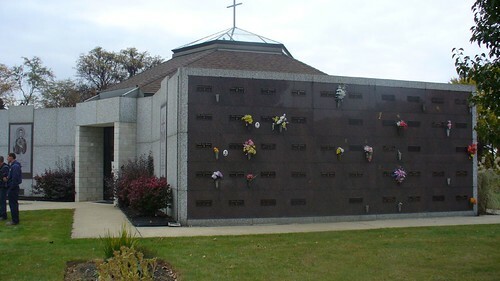 On All Souls day, Mass is usually offered at the cemetery. So yesterday Mr. Pete, Gabe, Noah, Izzy and I went to mass at the Catholic Cemetery where my father and Raphael are buried. 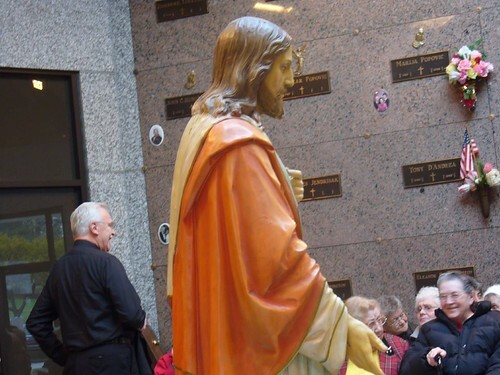 Mass is held in the beautiful Sacred Heart Mausoleum. Folks are interred both in the outside walls of the mausoelum as well as inside. We literally are having mass, singing, and praising God amongst the graves of many of the faithfully departed. This is the inside of the mausoleum set up for mass. You can see the walls with the name plates of the interred, the altar, and a beautiful statue of Jesus in the center of the area. We sat on folded chairs. Father McCann in the very corner of the picture celebrated mass and he was assisted by a Deacon who had just show up for mass, and by my son Gabe who served. Music was provided by a guitarist (with a great baritone voice) and a soprano. They were lovely. They have been there every year since I started attending. Father McCann just gives a great homily every year about how death is a continuation of life, and how we know the spirit has gone on but we still honor the bodies of the dead and look forward to the resurrection. He even tells a joke about where he will be buried in the cemetery just down the hill from the giant cross by the water spicket! He says he really will be "over the hill" then! His gracious humor and insight are always so inspiring and just what I need to hear every year. 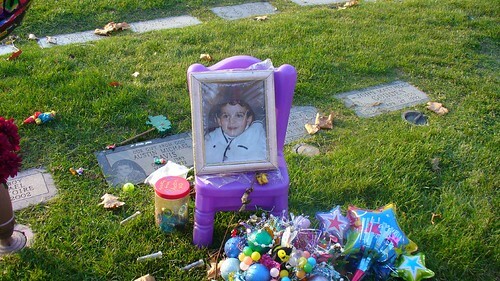 After a brief prayer at my father's niche, we went to see Raphael's grave, in babyland. There was a little jar of candy there "From Austin" for Halloween. Austin's mom knew my kids from cross country this year, so I thought it was very kind of her to leave these special treats and the kids enjoyed Austin's treat! Then we had a chance to pray for Raphael's intercession and give thanksgiving to God for our little saint. This is one of those yearly rituals that has become so important to me and my family and a part of how we remember our beloved dead during the month of November. For an interesting article on the history of Catholic Burials, particularly in the Cleveland Diocese, read this.